SCS Fan Club Christmas Card Challenge! Here is a link to the Fan Club info if you are interested! 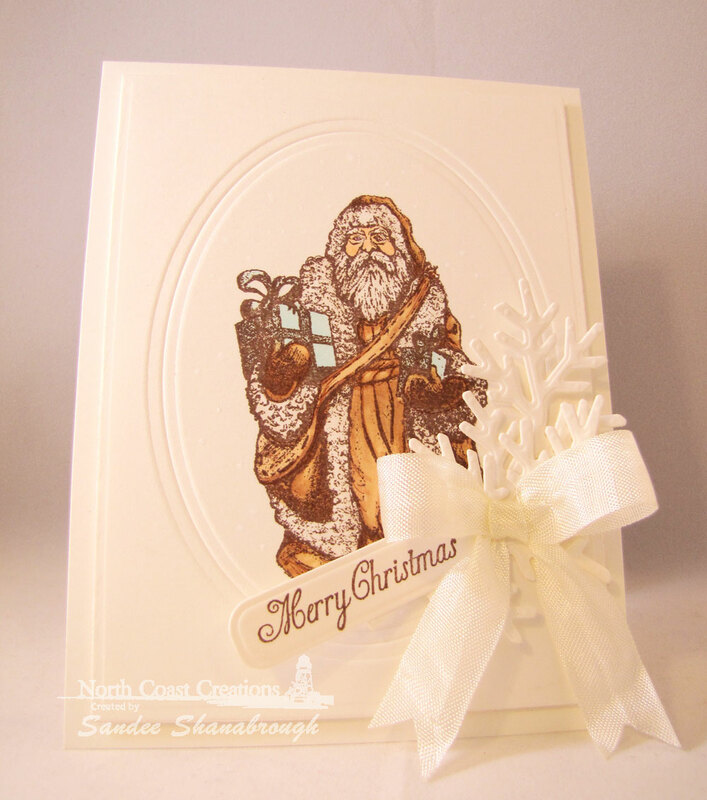 My card features Santa's Sleigh from North Coast Creations. In keeping with this month's theme, I colored with copics adding a few stickles here and there for sparkle. 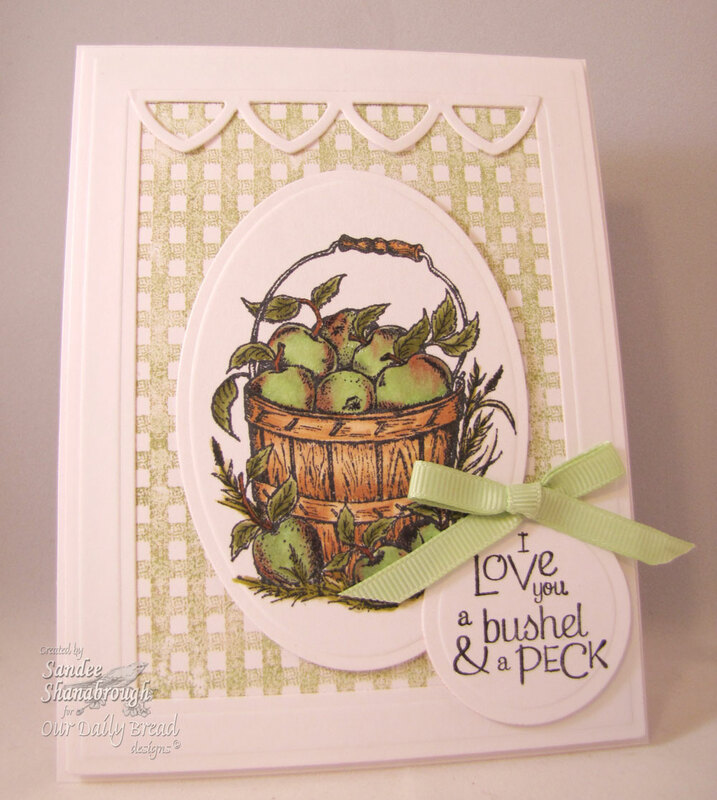 My 'trees' and the greenery are part of the ODBD Custom Fancy Foliage Dies. This is all layered over a pretty designer paper background. I finished the card with a pretty seam binding bow made with Becca's Peg Bow Maker! 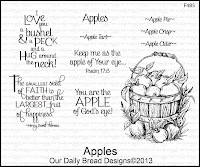 The Apple of God's Eye! lovely cool temps here in my neck of the woods! This new ODBD Apples image is colored with copics and I added glossy accents to the apples to give them that apple shine! 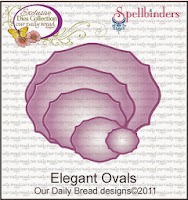 I cut it out with the ODBD Custom Elegant Oval die and placed it over two of the new ODBD Custom Decorative Corners. 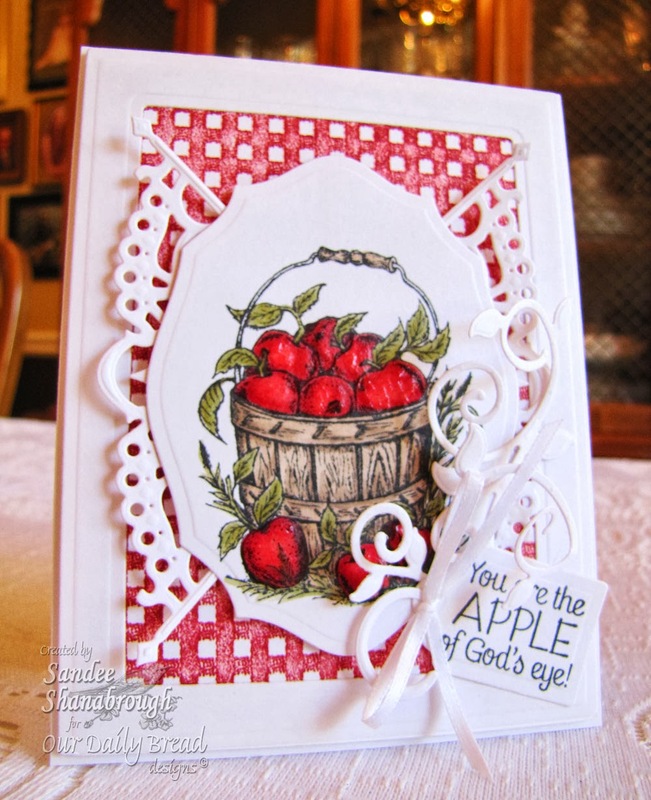 The background is ODBD Gingham Background and is framed with Spellbinders Matting Basics. The little vine is from ODBD Custom Fancy Foliage dies and the tag is ODBD Custom Recipe Card and Tag dies. 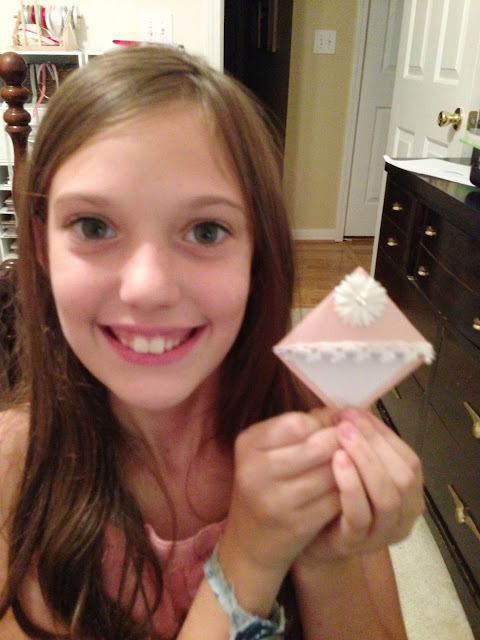 The little bow was made with Becca's Peg Bow Maker! Good morning ODBD friends! Today the bread sticks are taking a look back at the September new releases! 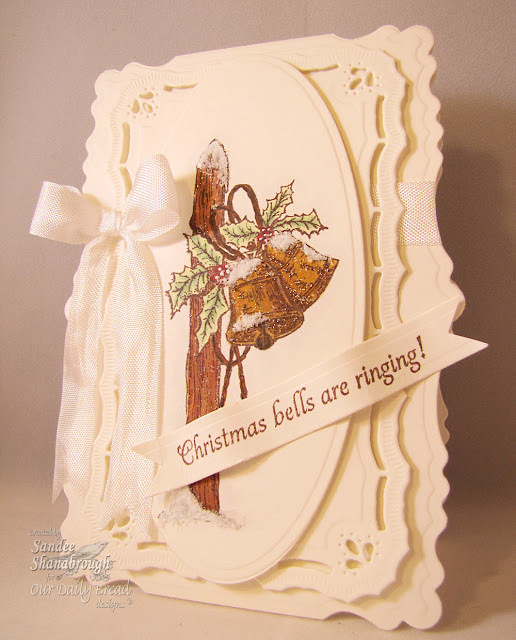 My card features the Jingle Bells set! 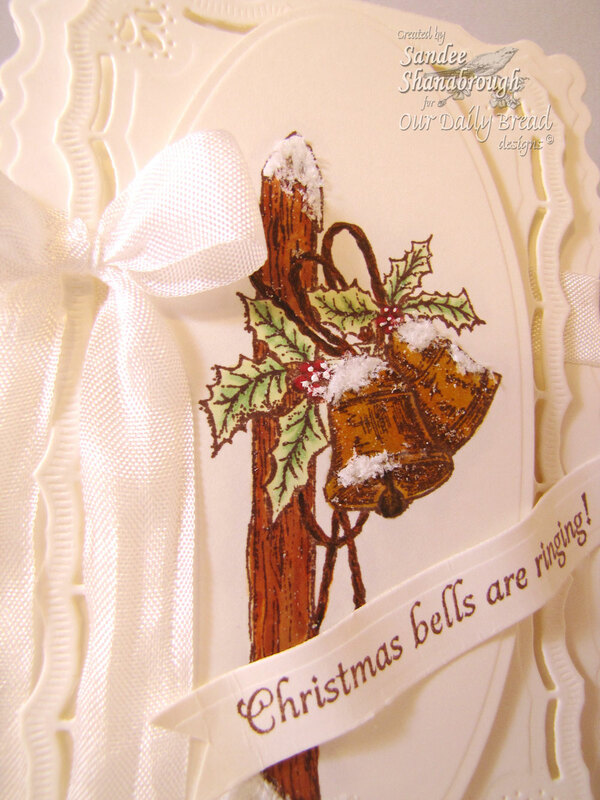 I was in the mood to create an elegant Christmas card! I colored the image with copic markers and cut it out with a Spellbinders long oval. I added white flower soft for the snow areas. I created the shaped base card with Spellbinders Labels 29 and the added a layer of a diecut from Spellbinders Resplendent Rectangles. 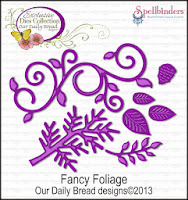 I made the banner using one of the dies in Spellbinders A-2 Matting Basics A. The seam binding bow was made with Becca's Peg Bow Maker. I also 'painted' the image with stickles for an icy look! We thank you so much for stopping by! Rum Pum Pum Pum and a Beautiful Bookmark Made Just For Me! Hello there! Hope everyone has had a good week so far! I have a couple of projects to share this evening. One made by me and one made by my oldest granddaughter! 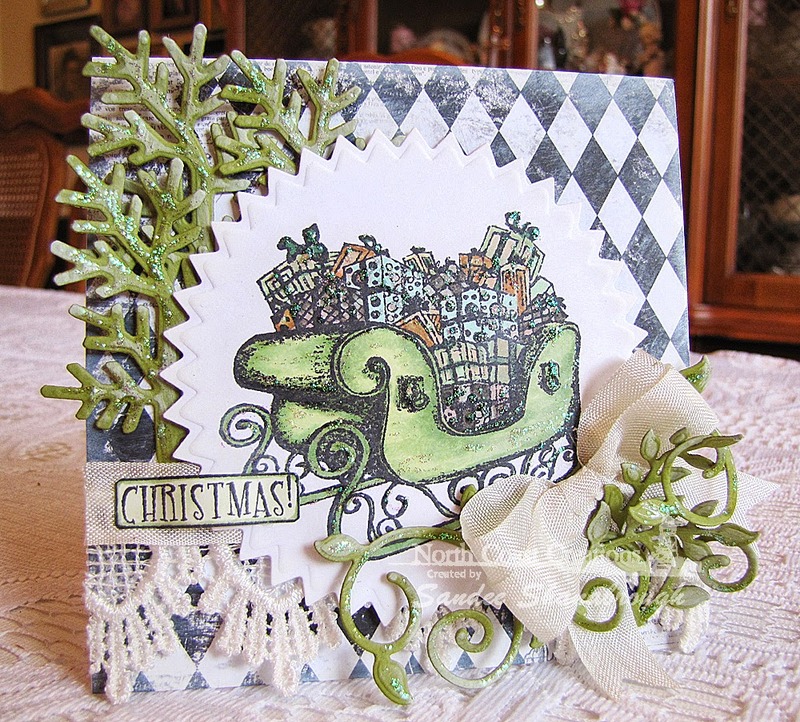 First, here is another Christmas card for my stash! Woohoo! 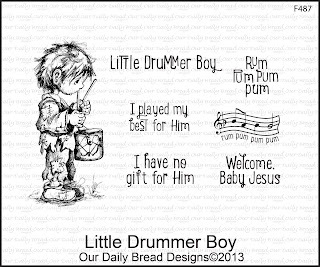 I used the new Little Drummer Boy set from Our Daily Bread designs. He is so cute and so fun to color! I colored him with copic markers and cut him out with a Spellbinders Oval. 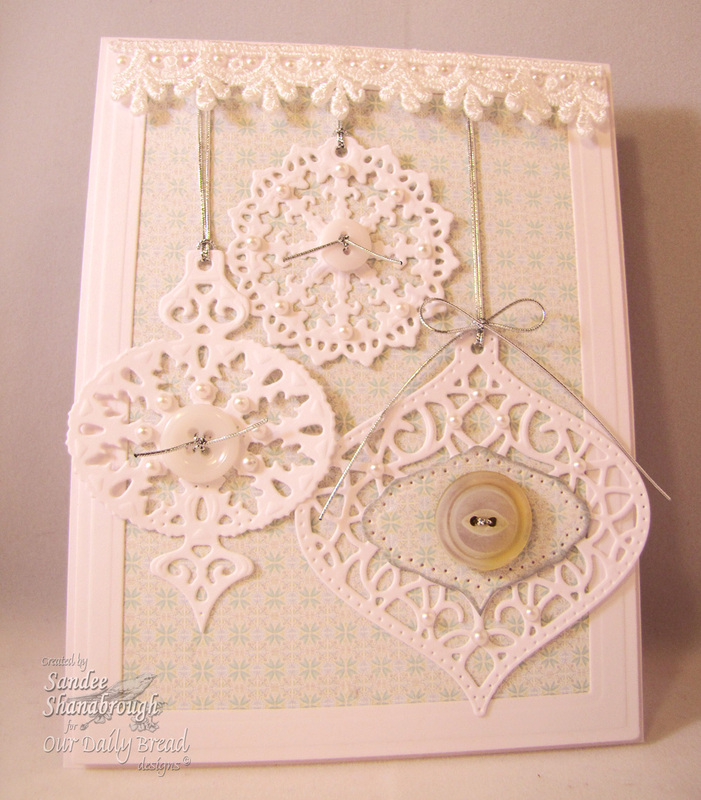 I layered the oval over the ODBD Custom Quatrefoil Pattern Die which is framed with Spellbinders A-2 Matting Basics. 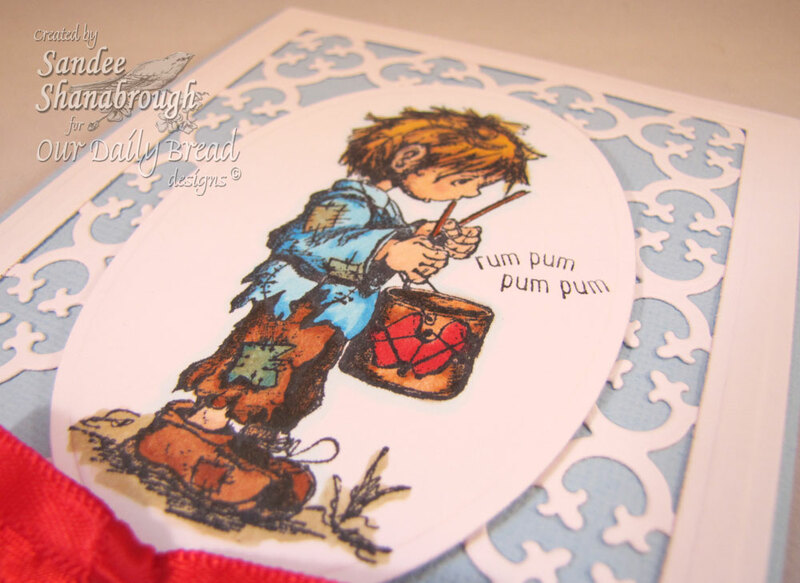 The sentiment was masked from the little music stamp! I made the bow with Becca's Peg Bow Maker and attached it to complete the card! And here is the second project I want to share tonight! Last night I kept my three granddaughters for a few hours. My oldest grand, Eileen, had found a tutorial on how to make corner bookmarks and had already made one for herself. It looked like a monster and I wish I had taken a photo of that too! Oh well! But while my granddaughters were here, Eileen, made this one for me! Isn't it so pretty! Pink and lace and a pretty flower! Can't get much better than that! Sorry the photo is a little blurry. I took it with my iphone. And I should have taken a pic of the back too but unfortunately I did not! We used the cute little Stamped by Mini-Chickadee and then she signed her work! She is a crafty little lady at 11 years old! She crochets too!!! So proud of her and all my grands!!! They are all such a blessing from God! and for letting me show off one of my grands for a little bit! 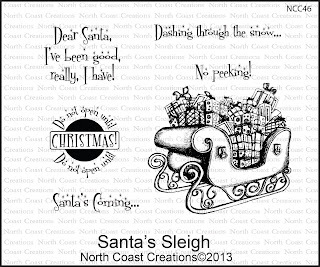 New Releases from North Coast Creations! Welcome to the North Coast Creations September New Releases! Don't you just love the new sets? Christmas will be here before we know it! 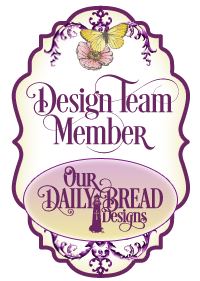 We will be choosing 2 winners who will each receive a $10 gift certificate to the store for stamps just for commenting on our Design Team cards! 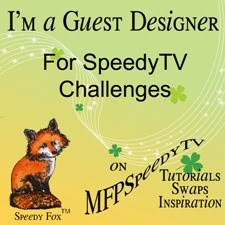 You have until September 17, 2013 at 10:00PM EDT to make a comment on each of our designers blog posts. Our 2 random winners will be announced on the NCC blog on September 18, 2013. 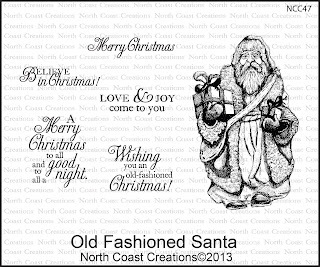 My first card features the Old Fashioned Santa set! I colored Santa with copics in sepia tones with a hint of blue. The twigs are cut with the ODBD Custom Fancy Foliage dies. 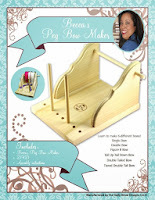 The bow was made with Becca's Peg Bow Maker. 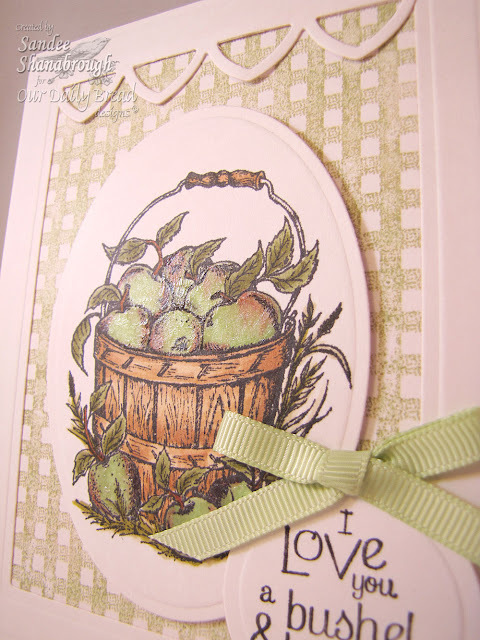 And I attached the sentiment tag to complete the card! I was going for a retro feel for this card. Again colored with copics in sepia and blue green tones to match the paper. I 'painted' the image with stickles for a little sparkle. The bow was made with Becca's Peg Bow Maker. The little clips were found in a forgotten stash of goodies I have! 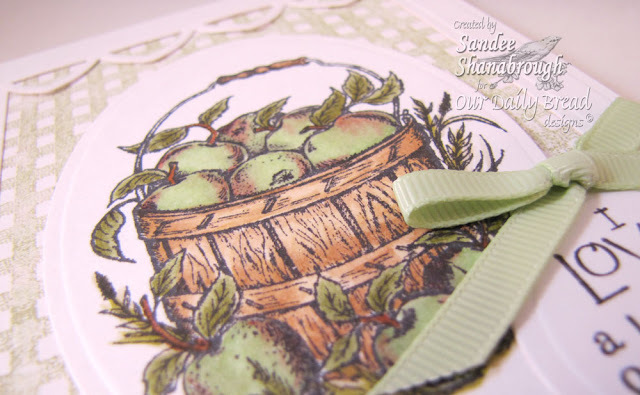 I was able to 'bend' the sentiment into a curve to stamp around the circle. And that is it! Don't forget to stop by all the designer's blog and make comments for your chance to win! Here are links for your convenience! Thanks so much for joining us and have a wonderful day! I love this new ODBD Apple set! So many possibilities! I colored the image with copic markers and cut it out with a Spellbinders Oval. 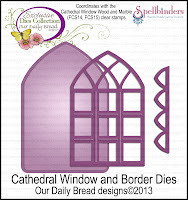 I made a frame with Spellbinders Matting Basics dies and added the little die cut border at the top from ODBD Custom Cathedral Window Dies. 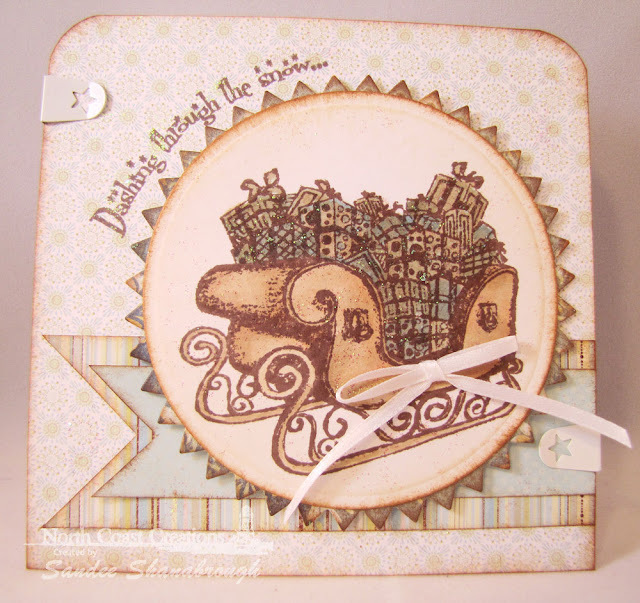 The sentiment tag is cut out with ODBD Custom Recipe Card and Tags dies and the bow was made with Becca's Peg Bow Maker. The background is stamped with the Gingham background. In this last photo you can see the glazing I added to the apples with Glossy Accents! Hello there! 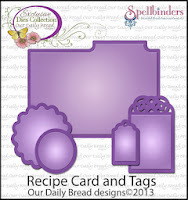 Did you know that ODBD has so many exclusive custom dies? Today I am featuring the newly released ODBD Custom Fancy Ornaments dies! So beautiful! I made a frame with Spellbinders dies and then added the ornament which is hanging from the twig die from the ODBD Custom Fancy Foliage die! Then I just added lots of rhinestones for a little sparkle and a silver bow! 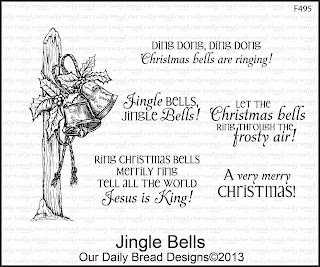 The little 'merry' sentiment is masked from a sentiment in the new Jingle Bells set. 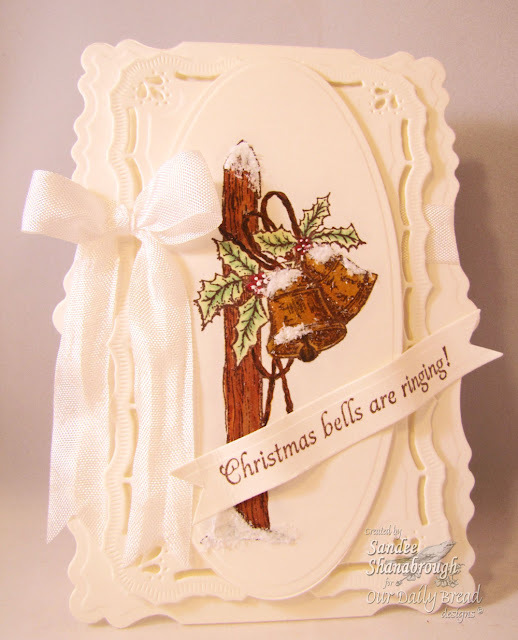 Here is another card using the beautiful Fancy Ornament Dies! This card has a softer look with lace and pearls and buttons. The center portion of the largest ornament is cut free hand out of the same designer paper in the background. (I had to do that to cover up a stamping booboo!) 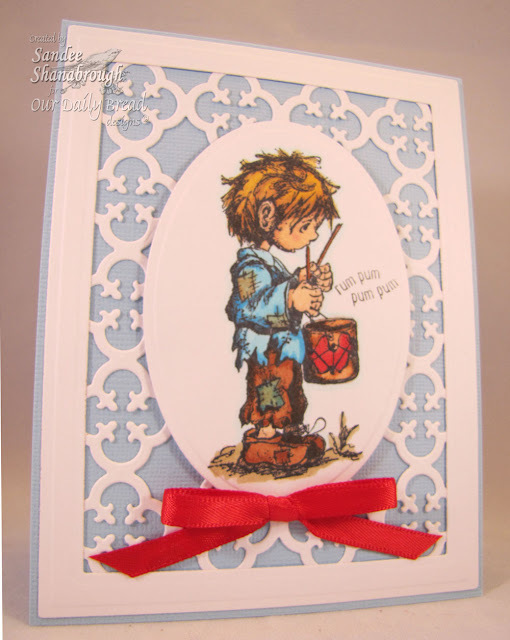 So no stamping on this card! haha!